Why Get a Flow Hive? Already have a beehive? You can order a Flow Super to fully convert a Langstroth hive to the Flow system of beekeeping. This Flow Super is built in Brisbane from sustainably sourced Australian Araucaria (Hoop Pine) and, comes complete with observation windows, is designed to accommodate Flow Frames without any modifications. The patented Flow Frame technology is made in Brisbane from durable, BPA- and BPS-free plastic. Comes flat-packed and unsealed, leaving you with the satisfying experience of assembling yourself and bee-ing creative by painting or sealing it to suit your personal tastes. Timber components and Flow Frames ship in separate boxes. This is not a complete hive and is designed to be added to an existing hive. Does not include bees! Click here for info on how to get bees. Flow Hive is so much easier for the beekeeper, and so much gentler on the bees. Watch through the side and rear window and see all the girls making honey! There are just so many intriguing things that bees do - the learning never ends. Easily harvest pure, unheated, unprocessed, untouched, raw delicious honey directly from the hive! No mess, no fuss, no expensive processing equipment, and much more gentle on the bees than conventional harvesting. With Flow, you can fill just one small jar from part of a frame and bring it straight to the kitchen for breakfast, or harvest one or more Flow Frames and share it with your friends! Because you can harvest single frames directly into your honey jar, you get to taste all the different flavours of the seasons without the blending, heating and oxidisation associated with conventional harvesting methods. Bees tend to fill frames one at a time, so each Flow Frame will reflect the flowers that were blooming when it was filled, allowing distinctive variations in colour and flavour to shine through. With Flow, harvesting honey is now something you can easily do with friends and family. 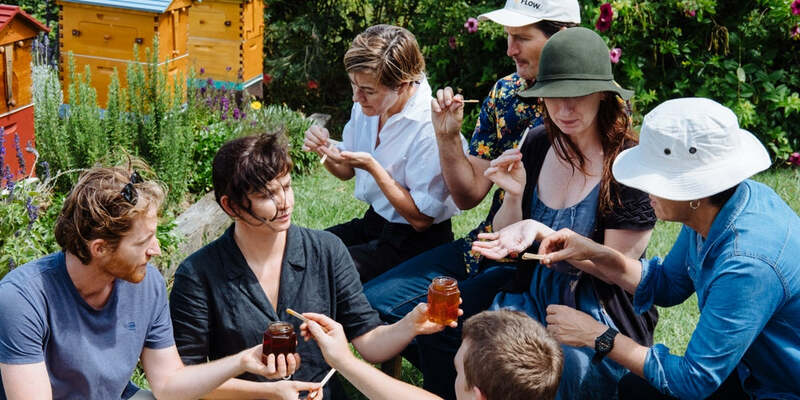 To share the experience and gift honey to your friends is one of the great things about keeping bees. Bees play a huge role in pollinating the food we eat. Keeping bees brings awareness to the cycle of life we all depend on. 6 (Classic model) or 3 (Hybrid model) Flow Frames width: Equivalent to width of an 8-frame Langstroth hive/super/brood box. 7 (Classic model) or 4 (Hybrid model) Flow Frames width: Equivalent to width of a 10-frame Langstroth hive/super/brood box. Our invention - the biggest innovation in beekeeping for 150 years - was originally launched in 2015 through a record-breaking crowdfunding campaign. It’s hard to think of a more rewarding hobby than beekeeping. It was hot, sticky, heavy work, involving special equipment and lots of squashed bees. After a decade of tinkering, my dad Stu and I invented the beekeeper’s dream – the Flow Hive. It makes harvesting honey as simple as turning a tap and watching as up to 3kg of pure fresh honey pours out into your jar from each Flow Frame. And because it’s completely unprocessed, it tastes amazingly good! If using a Hybrid Super mixing Flow Frames and traditional wooden frames, you can also harvest fresh honeycomb, more details here.